This image was done in the Rosebank Commercial Center in Johannesburg, South Africa. It was the first image of three that I completed on a South Africa Tour for Hyundai. It was my second trip to South Africa, the first one was for Honda Formula One Racing, where I did a work for Jenson Button, (the famous racecar driver), to pose on. That time I flew from Italy, which was a whole lot closer. From Washington state the flight is about as long as they get. In the end I was in the sky for a couple of days. Then there was the 11 hours of time difference. I had a couple of days to get over jet lag and my hosts took me to a lion park outside of Johannesburg. There you can actually get into a fenced area and pet a lion. Talk about a liability nightmare! In truth they were lion cubs and very cute, so I couldn’t wait. I went in completely fearlessly and sat down next to one. Sure enough, it bit me! The keeper had to pry its mouth open so I could pull my shoulder out. It was only being playful, but it had a really strong jaw and sharp, sharp teeth. It was not going to let go. I moved over to a more docile beast and was able to pose for a less dramatic picture. All in all I came off pretty well, not everyone can say they were bitten by a lion in Africa. 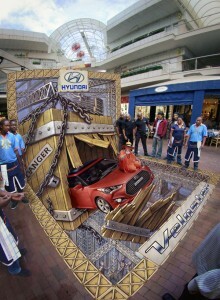 On 1st April, the inventor of 3D pavement art will be amazing the people in South Africa when he creates a stunning piece for the launch of the all new Hyundai Veloster. With an international following, American artist and founding father of 3D pavement art Kurt Wenner will arrive in South Africa to create stunning 3D artworks across the country as part of the Hyundai Veloster launch campaign which kicks off in March this year. The public will be given the opportunity to view this world master three-dimensional illusionist artist in action as he uses his amazing techniques to produce a 3D art work which will no doubt become the talk of the country. Wenner has been responsible for creating massive hype in real time as well as on the virtual platform as his art works have assisted in driving millions of potential customers to web sites and encouraging viral tidal waves on the internet – his paintings created the first ever visual art viral storm on the internet. Hyundai has invited Wenner to participate in the launch of their new car, the Veloster, in the South African market. This campaign will prove how his exciting art works will very quickly carry Hyundai’s message to the public as it not only wows the crowds in shopping centres across the nation, but also gathers massive momentum on a viral level. ”Hyundai has always been extremely interested in supporting arts and culture in South Africa. This has in fact, been represented through our sponsorships in the past 5 years and our association with Kurt Wenner and the new Hyundai Veloster goes on to showcase this alignment. Hyundai is very excited to have Kurt Wenner in South Africa and looks forward to amaze South African audiences with our new Veloster and his incredible artwork. “The Hyundai Veloster is an innovative creation by the Hyundai Motor Company, just as Wenner’s art represents an innovative approach in an art discipline where so many avenues have been explored already. It is such innovations that make the world a more interesting place, and which put Hyundai among the leaders in the automotive industry,” comments Albrecht Grundel, Operations Director Hyundai South Africa. It is always a relief when the events are concluded successfully. There is always a lot of pressure to live up to the expectations created during publicity events.